The big changes start with the draw this Tuesday (Oct 31 2017). So it is a bit of a mixed bag. Unfortunately the jackpot is now even harder to win, especially when you consider that a ticket now costs twice what it used to. But the odds of winning the 2nd prize of $1 Million have actually improved. The most controversial change will of course be the price rise though. Which will also mean a bit of a scramble for Mega Millions syndicates to restructure their groups. Powerball was made harder to win so it creates more rollovers and bigger jackpots. Mega Millions is competing with those jackpots. Previously it offered something different by being half the ticket price, but these changes bring things almost completely in line with Powerball. Although the Powerball jackpot is now slightly easier to win with odds of 292 millions to 1. 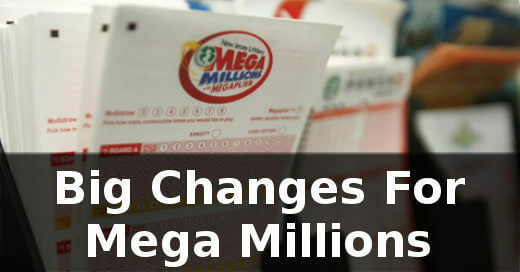 One other novel change is that Mega Millions will now offer a ‘Just the Jackpot’ option. If you’re willing to give up the chance of winning anything smaller than the jackpot, you can opt to play for only the jackpot prize. This may help make the price rise less painful to some players, as it will cost $3 for two plays. Still 50c a play more than it used to be, but it is an option. If you do choose to play this way though, just be very clear that you can’t win anything smaller than the jackpot. If you match 5 numbers but not the Mega Ball you won’t win anything at all. That could be a difficult result to accept! Do you think Mega Millions have got this right? Are bigger jackpots what you want? Or has this ruined the game for you? 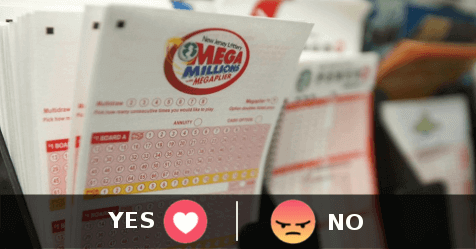 Will you continue to play Mega Millions or switch to Powerball now? Or another game? Let us know by adding a comment below. Do Powerball & MegaMillions Rollover Too Often? By joining LottoLishus on 10/12/17, it actually DECREASED my odds of winning the larger Mega Millions prizes because their website only allowed me to select white balls 1-70 instead of 1-75 as per the official game rules (until today’s change to 1-70). I emailed their Customer Service on 10/12 & again on 10/26 about this serious problem & NEVER got any reply to these, or any of my other 2 emails sent on 10/12 & 10/14 about some of my other problems & questions about content on their website. So, I had to research their office phone #, which is (559)374-2001 in Fresno. Since it was not disclosed on their website. I called them for 4 consecutive days (10/24-10/27) during normal business hours & no one ever answered. So, each time I had to leave messages on their answering machine as to how serious this problem was since I could not play any of the 5 numbers 71-75 & asked them to call me back ASAP. To date, no one has ever contacted me (either by email or my cell phone). On 10/20 drawing, one of the winning #s was 73, which I had wanted to play since I joined but couldn’t. I assume every other member must have had the same problem, too. Since LottoLishus has only one website. Rather than poor service, I got NO SERVICE whatsoever. I have seen other LottoLishus members’ blogs on various websites posting their outrage & similar complaints that no one would ever answer their emails sent to Customer Service, they could not withdraw their account credits (winnings) when less than $10 as per the Subscriber Agreement. And, no disclosure as to what happens to all the departing members’ winning totals under $10 that apparently can’t be legally withdrawn under this Agreement. SCAM? Who is pocketing all of these small winning account credits when members can’t withdraw their own monies? SCAM? Other LottoLishus members who have also quit have posted that they kept getting charged the $7.99 subscription cost every 4-week cycle after they cancelled their memberships. They posted that closing their bank accounts was the only way to stop LottoLishus from continuing to bill their credit cards for unauthorized subscription renewals. I would urge anyone who is also still having or has had unresolved problems with LottoLishus to call their Fresno Office (PST) & see if anyone ever answers or returns their calls. Also, please contact me as I continue to gather facts & evidence to determine if LottoLishus is operating illegally. Finally, I would appreciate Lottery Syndicate World contacting me to discuss in further detail my recent bad experiences with the LottoLishus syndicate. Since you continually review, evaluate & rate lottery syndicates everywhere. Incidentally, my Referrer to LottoLishus is Richard Lustig as I am a member of his LotteryWinnerUniversity’s personal pool universe. I will be emailing him shortly to notify him of my continuing problems & request his assistance in resolving these matters with LottoLishus as I only joined based upon his personal endorsement. OK, this doesn’t really have much to do with the Mega Millions changes, but I’ll respond here anyway. That said, getting no response at all from their customer service is not good enough. This is something we will be following up with them. On the point of withdrawing winnings, all companies have to set some minimum on this as there are costs involved. So $10 is certainly not unreasonable. And any funds below this can simply be used to pay for future entries. So I don’t think shouting scam here is at all helpful or accurate. I’d also be wary of ‘outrage’ posted online. Happy customers rarely leave reviews or write blog posts, whereas a few unhappy customers (all companies have them no matter how well they do) can appear to be a lot more numerous than they really are. I think I will start playing Cash4Life and NJ Pick 5, and forget the rest. The new Mega Millions odds are a very bad idea. The average player would rather see odds where we can see a big winner every 3-4 weeks with a smaller purse at $30-50 million, rather than only several times a year in the hundreds of millions. More winners not less is ideal.